I signed up to be part of Tara's creativity exchange a couple of months ago. And I am finally, FINALLY, ready to send my part of the exchange to my partner. 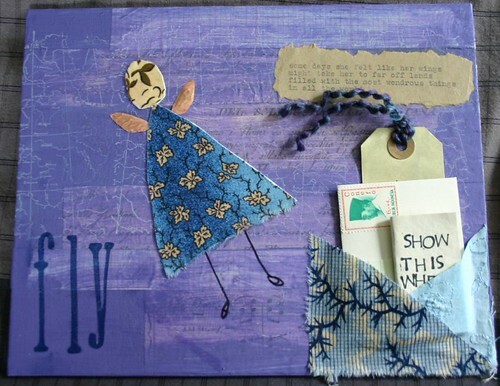 And I have finished another piece of art for a swap I am doing with another blogger. 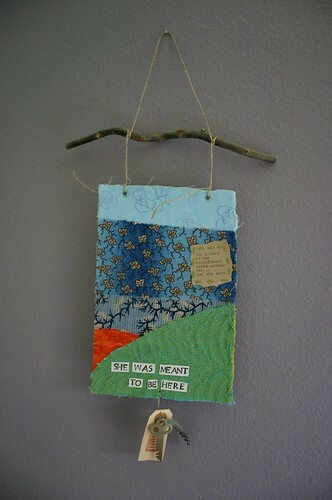 I am having fun trying to incorporate fabric into my art. And I am also working through feeling frozen sitting at the dining room table staring at a blank page and all my art supplies. After Artfest, I felt a bit overwhelmed by all I had learned and seen. Frozen in front of the blank page. So, it actually has taken me since Artfest to complete these. Sunday, Monday, and Tuesday have brought a new surge and excitement! 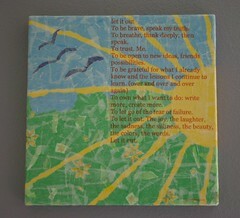 This is from Chest of Drawers for the Creativity Exchange. I smiled from ear to ear when I opened it. And I was so touched that she chose to use the words from this post. And then today, I was almost late for my senior chair yoga class because I had to open the package from Vicci before I zoomed out the door. This photo is not as clear as I would like, but there is a great photo at Vicci's page and some more on my flickr page. With both of these you can click on them to see them upclose (but if you gave them to me you may not want to because you will go to my flickr page that has the abovementioned photos of the items coming your way). Thank you for sending me such inspiring creations ladies! 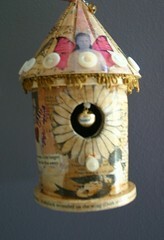 I hope to share more soon as I keep exploring and creating as I sing away to the Indigo Girls.